Amy has been a dog trainer for twelve years and received her certification while being employed at Petsmart. 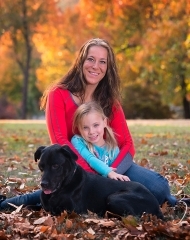 She fell in love with changing canines and their owner's lives through positive training. As her passion and love grew for training, she received five promotions and became the area trainer for Petsmart. Amy has now received her certification as a K9 behaviorist, Dog and Human Rehabilitation with Aggression, scent work, Therapy Dogs, and Service Dogs. She also is an evaluator for the Canine Good Citizen test and is a mentor and professor at the Animal Behavior College. Amy left Petsmart to continue her dream to start her own business. She ensured the company she created was family based and always had the clients best interest at heart. Most importantly she wants to make a happy environment for both owner and canine, along with saving lives. Amy has many accomplishments including being a member of AKC, ABC, and ADPT. Her hope is to continue to grow her business with her daughter by her side and continue changing the lives of so many. She currently runs three locations, oversees all trainers, Doggy Day Out, dog running, an dog sitting. She has also earned the respect of Rogers County Courts and has been requested to be their main source of training. Megan is a certified trainer through Animal Behavior College. She received her certification in 2009 when she lived in San Diego, CA. She knew then that she always wanted to be a dog trainer. In 2012, she moved back to Oklahoma. Megan began to work with Amy and Spirit Ranch Dog Training. In 2014, she adopted Luke who is a Lab/Pit mix that Amy rescued. Megan is now the head Trainer with Spirit Ranch and oversees the training at the three locations. She looks forward to learning more about the different areas of training. Megan is learning how to deal with Dog and Human Aggression in dogs which is something that she is very passionate in learning about. 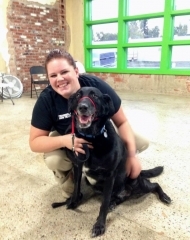 Training is a passion of hers and she looks forward to helping others and saving dogs lives. Sophie is a student at the University of Tulsa. As a student Sophie is apart of the Mortar Board, Deans list, Tri Delta, and is a Speech Pathology major. At Spirit Ranch she holds the positions of Professional Dog Trainer, Boot Camp Trainer, Dog Sitter, Doggie Daycare Manager & Customer Service Representative . She has worked with Spirit Ranch since 2014. Sophie is an energetic individual and is an animal enthusiast. She has a Doberman named Hael that everyone falls in love with when they meet him. Since she was young, Sophie rode horses and worked consistently as a barn hand. Her dream is to combine Speech Pathology and Service dog training. Cody is one of our trainers, Doggy Daycare Attendant and Dog Sitter. He has been working for Spirit Ranch since April 2016. He left Target where he was Front End Supervisor to come to Spirit Ranch because he has a strong love for dogs and all the dogs absolutely love to be around him. His passion and love for dogs is what makes him such a great trainer and employee. It definitely shows how much he loves his job in doggy daycare and when he is training in class or out in public. Cody is striving to learn more in the dog training field so that he can become a better trainer for his clients. He also wants to expand his training qualifications. Cody has a 3 year old Pit named Zoe who was rescued by a client of ours. Zoe and Cody instantly fell in love when they first saw each other. Shelley is Spirit Ranch's long time dog sitter. Her humor always manages to light up any room. Shelley is reliable, kind hearted, and enthusiastic. She has worked for Spirit Ranch loyally for over six years, and continues to exceed our expectations. Her love for dogs is inspiring.